Utilizing our offshore sites of TOYOTA TSUSHO NEXTY ELECTRONICS（THAILAND）CO., LTD.（NETH） and TOYOTA TSUSHO NEXTY ELECTRONICS（DALIAN）CO., LTD.（NEDL） we are expanding embedded software development, validation/verification services, and software Business Process Outsourcing (BPO). Our offshore operations ensure smooth communications through the Japanese language and project management know-how to achieve the high level of quality that our customers want. As the volume of automotive electronic control systems and the technologies utilized in automobiles are expected to increase even further, we are engaged in training our employees in model-based development, strengthening our development capabilities for image processing software used in autonomous driving applications, and we are also working on the development of on-board platforms. We are cultivating talent to handle contract automotive software development by hiring Thai software engineers and training them in the programming languages required for automotive electronic control embedded software, as well as in development methods, and quality improvement. We will contribute to the growth of the embedded software industry in Thailand by promoting and growing software development for automotive control systems within the country. 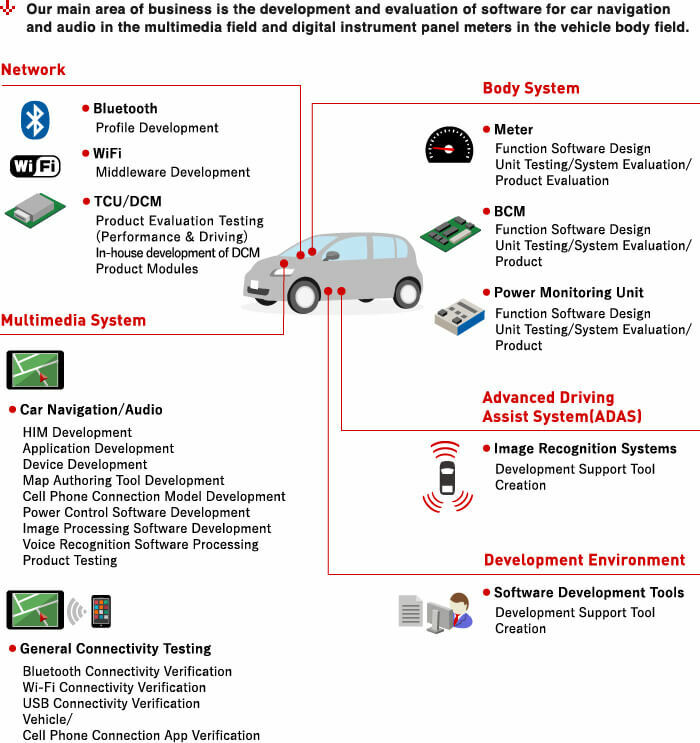 We provide contract development and testing of automotive embedded software to our customers. We develop software for automotive multimedia, instrument panel meters, and wired and wireless internal and external communications, as well as perform software localization. We aim to become the number one automotive software development company in China. We can offer automotive software that meets quality requirements for mass production, and we can promote projects together with overseas business entities, as can be seen in our track record of overseas offshore that spans more than a decade. Copyright c NEXTY Electronics Corporation all rights reserved.